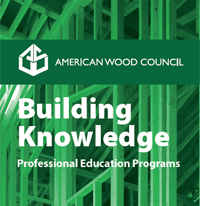 The American Wood Council (AWC) is the leader in development of building codes and standards for wood design and provides online and live contact training to support their implementation. Courses that are registered with the NCSEA, AIA and ICC are demarcated on this website by their respective icons. Please note that the AWC, NCSEA, AIA and ICC do not warrant that the program complies with the continuing education requirements in all jurisdictions. NOTE: ​As of July 1 2016, 50 percent of the CEUs required for ICC Certification renewal must be earned from training by ICC or an ICC Preferred Provider. Download our FREE Informational Education Brochure! View a list of upcoming events, including in-person presentations and webinars. AWC’s eCourses allow users to earn continuing education credits on-demand. eCourse options include watching a pre-recorded event or reading a technical article. Upon successful completion of a quiz on the material, continuing education credit will be awarded. Registered courses are available providing credit from AIA, ICC, and/or NCSEA (NCSEA does not allow eCourse credit for technical articles). These courses are free to explore and learn. Many courses do, however, require a basic understanding of engineering principles. To start an available course, click on the eCourses icon next to the course number (the course numbering does not imply prerequisites). Experienced, qualified AWC staff can provide training nation-wide. Seminar attendees receive special discounts on publications, a comprehensive seminar materials package, and a certificate upon seminar completion. Please note that AWC, AIA, ICC, and NCSEA do not warrant that a program complies with the continuing education requirements in all jurisdictions. AWC's seminars are ideally suited as continuing education for code officials (building and fire officials) and design professionals (architects, engineers, and building designers). To arrange a live presentation for your state or local chapter, complete the Request Form outlining which courses you are interested in, the expected size of your group, and an approximate date. For upcoming seminar events, see our calendar. For other educational resources, see reThink Wood and WoodWorks. Education resources including Frequently Asked Questions (FAQs), materials for upcoming webinars, and multiple attendee forms for webinars.